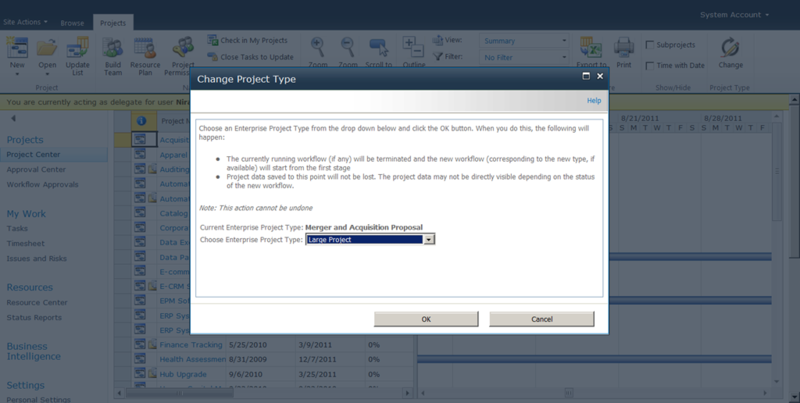 Here’s an interesting question that popped up recently…how does one secure a specific Enterprise Project Type within Project Server 2010 so that only specific people may be able to create it? Let’s start off by reviewing the specific business scenario. We have an organization that has small, medium, and large projects. Each of those projects is mapped to various initiation processes and has been assigned a specific enterprise project type (EPT). All large projects must go through an executive approval process, which for now is a manual application. The application process happens through the use of a form, which then gets signed by the relevant executives. Once the appropriate signatures have been received, the PMO administrative assistant creates the project record based on the form. The other path is that users may create a Medium project, then apply to get that project promoted to a Large project. 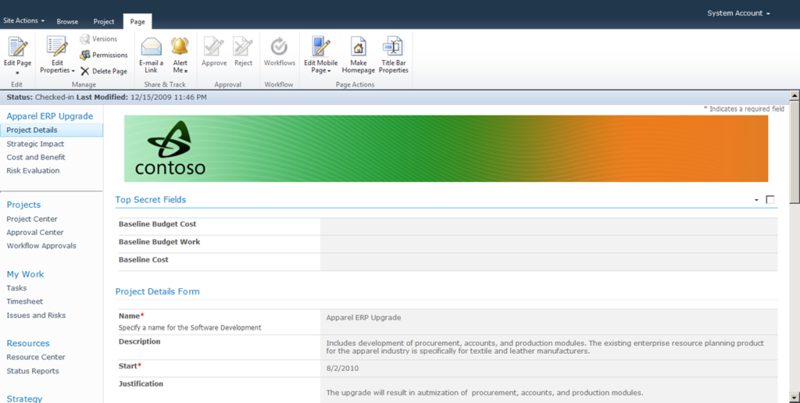 The application process is the same as defined above, and once the approvals are in place, the PMO administrative assistant will promote the Medium project to a Large project using the Change Workflow button on the Project Center ribbon. The challenge was that the users were getting confused and would go ahead and create a Large project – even when the approval hadn’t yet been completed. We initially attempted to train this behavior away, but found a need for more effective enforcement mechanisms. Honestly, my first thought was to implement some sort of workflow on the backend to ensure that only authorized users would create the restricted project type. Of course, that would imply that I would have to actually get up and talk to a developer….something I try to avoid at all costs. (Besides, that’s what the TFS Integration Pack is for, so I never again have to actually talk to a developer.) Then, I realized there’s a pretty simple no code solution. Enter the workaround. First off, we need to look at the Resource Department field. By default, this is a single-select field, i.e. only one value may be entered. If you’re not really using this field, great. Leave it as it is and continue following the instructions below. 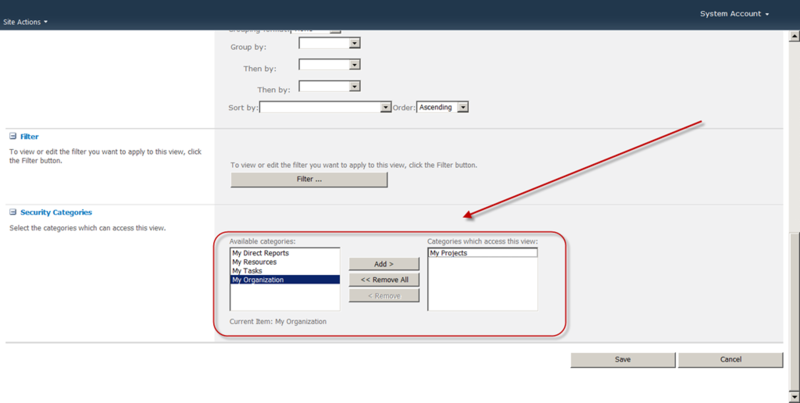 If you are using this field, then you may wish to consider changing it to a multivalue field. Before you do that though, a couple caveats…. Changing a field from single value to multivalue is irreversible. You may not change it back. 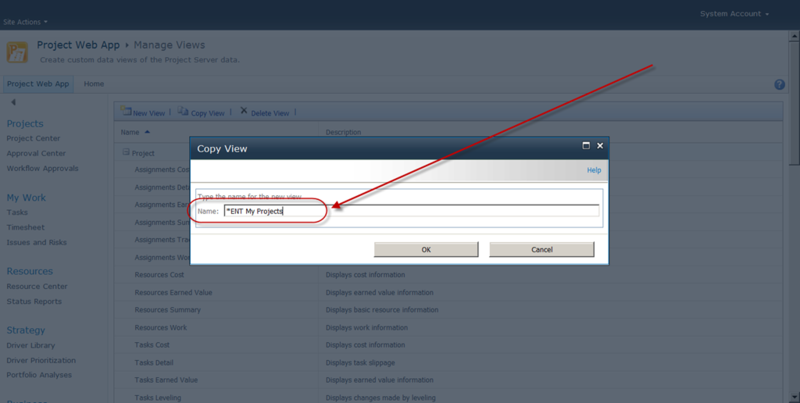 Changing a field to multivalue makes it much harder to bring into the Office Data Connection files you may be using to support your BI reporting. Review the SDK for guidance on incorporating multivalue fields in the ODC queries. Changing a field to multivalue may potentially break your OLAP cubes. See this post from Brian Smith for a nice synopsis. That being said, in my preliminary testing, new cubes built after the field change seemed to work just fine. Even if you don’t break your cube, adding resources to multiple departments may cause odd numbers to appear in your enterprise OLAP cubes, i.e. 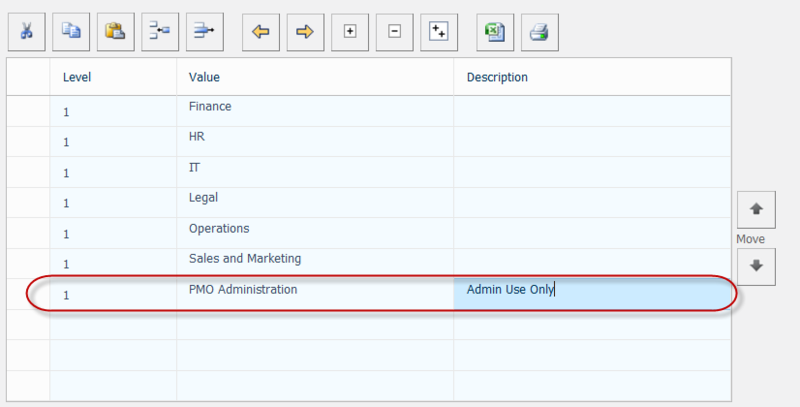 a resource in “HR” will show in a different department than a resource flagged to “HR, Admin.” Of course in this case, we’ll simply change the values for our administrative assistants or PMO members – who may not be under the same scrutiny for remaining capacity as a more technical resource. That being said, if you have already changed the field to a multivalue, then ignore all of those caveats, and feel free to continue. Map the Large project EPT to the PMO Administration department. One more step remaining. Pick the individuals who will be allowed to create the Large projects and add them to the PMO Administration department. In this case, I’ll use Niraj Shah as an example. I modify his record to include the right department. There are probably still ways to get around this obstacle, but overall, it’s an easy and elegant method to make it harder for users to accidentally stumble upon process exceptions. Probably worthwhile to point you over to Robert Hoover’s post yesterday on some of the great content released this summer…. Big thanks to the folks responsible. Make sure to check out the Pivot Viewer if you haven’t already. Still obsessing about PDPs and how I can extend them with little or no code. In this episode, I decided to explore how to lock down a PDP. The primary goal is to enable read only access to a PDP for select members of a security group. This post represents my first attempt, to see if I could simply implement security on the page. In an upcoming post, I’ll document how to emulate a read only PDP by embedding an InfoPath form to surface Project Server data. Security trim PDPs so that they only show up for Group A and not Group B. Create read only PDPs and make them show up for Group B and not Group A. 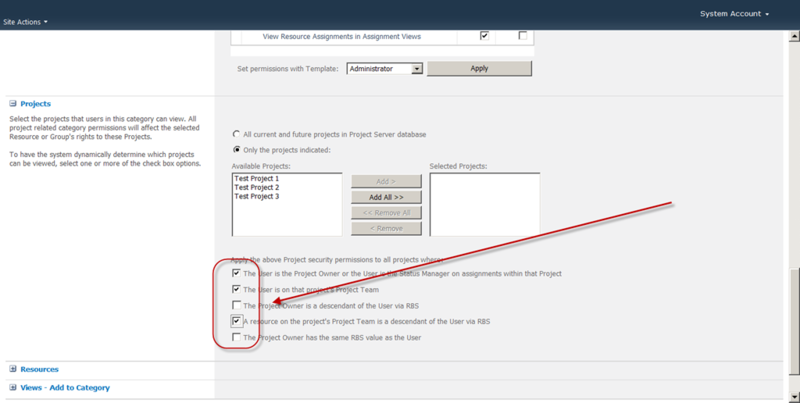 And presto, you kind of have field level security as long as the PM doesn’t figure out how to open the project in Microsoft Project Professional to change the fields. Since many PMs are now working almost entirely in the browser, that might be good enough for some organizations. So after some experimentation, here’s how to do it. 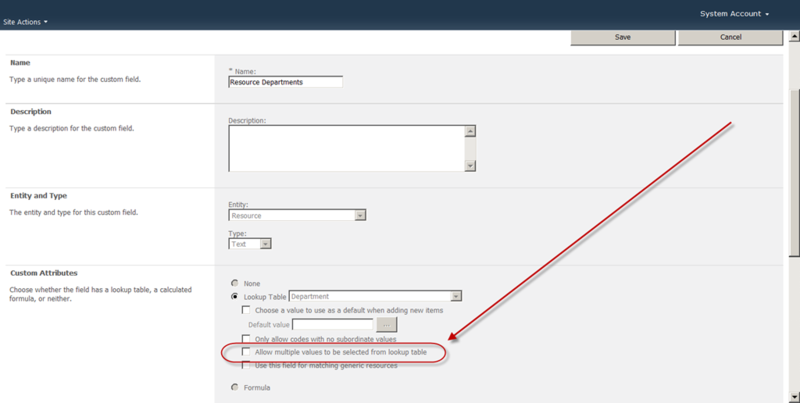 Navigate to the PDP library in Server Settings. Click on Library Settings under the Library tab. Mouse over the PDP, and click on the drop down option. 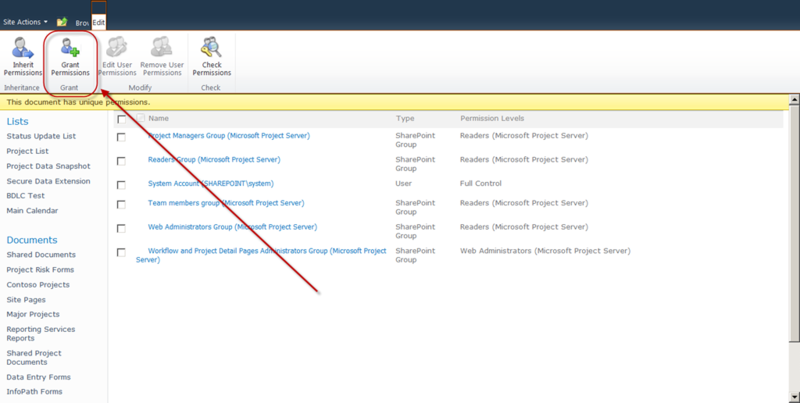 Select the link to Manage Permissions. Under the Edit tab, select the option to stop inheriting permissions. Users may now be granted or denied permissions as required. Note that as far as I can tell, even readers of the page will have edit rights within the Webpart (assuming they have permissions to edit the project itself). 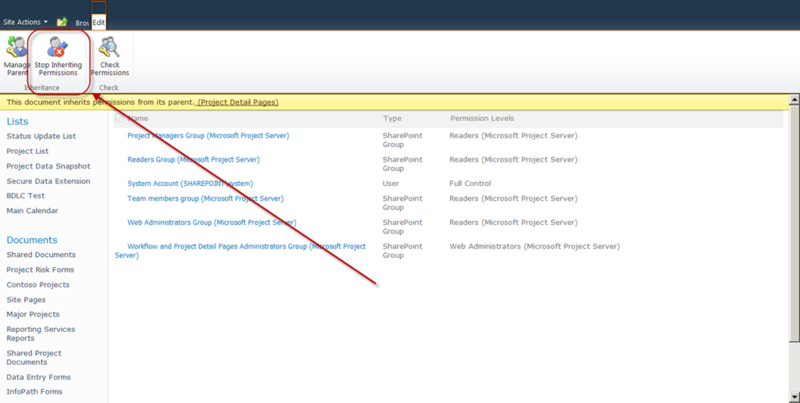 Based on the permissions however, the page will appear (or not) in the links on the top left of the project page. So that’s progress. 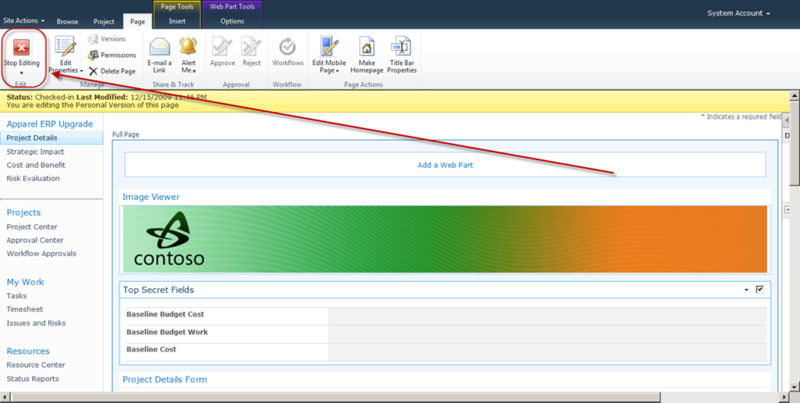 Coming up next….using InfoPath to render read only PDPs. 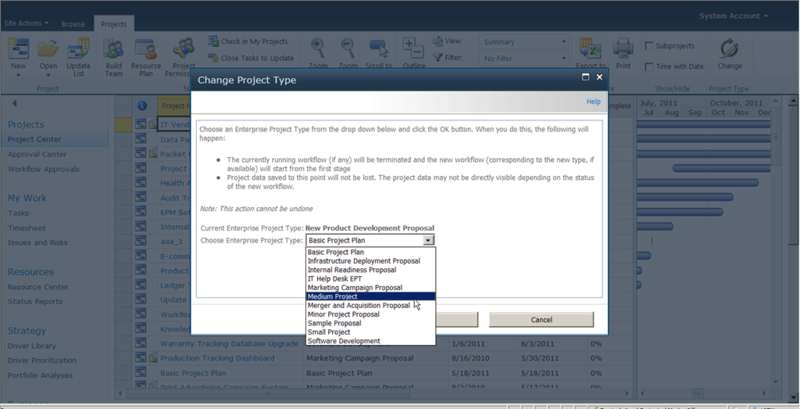 With the expansion of Project Server 2010 to include enhanced capabilities in browser-based project creation, I have found many organizations hard pressed to manage the sheer numbers of projects that now appear in the Project Center view. 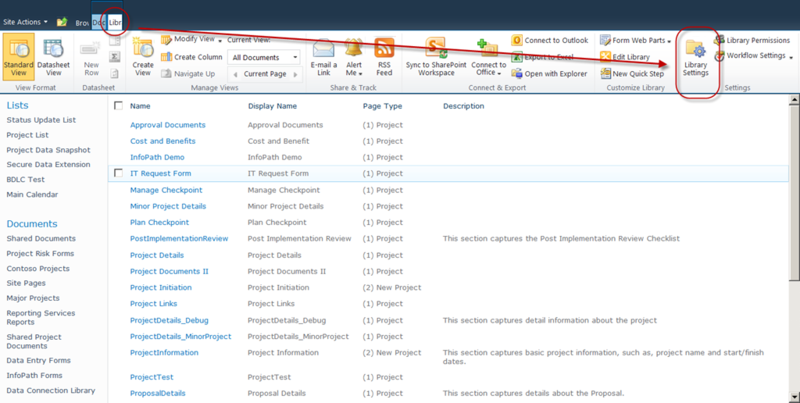 This post documents a quick and easy view that may be created within the Project Center view to filter projects on only those projects where the user is the owner, essentially creating a “My Projects” view. 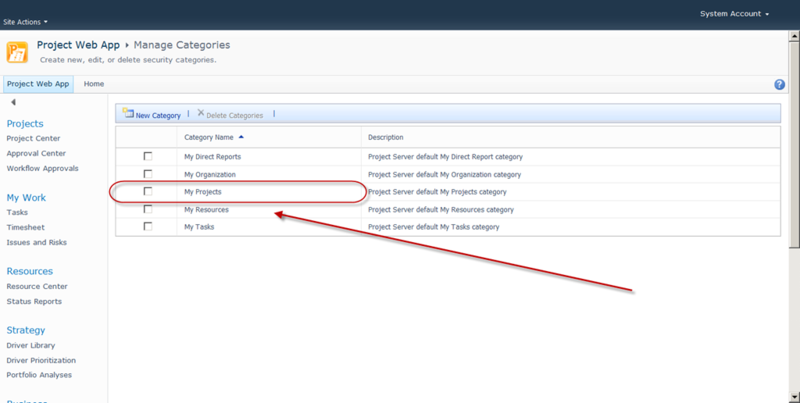 Your organization, like many organizations, allows project managers to see all projects read-only – or at least all projects within specific parameters. Your organization is using a more or less default security model (whatever that means). Let’s say that your security model isn’t too crazy and hopefully is compatible with this configuration. 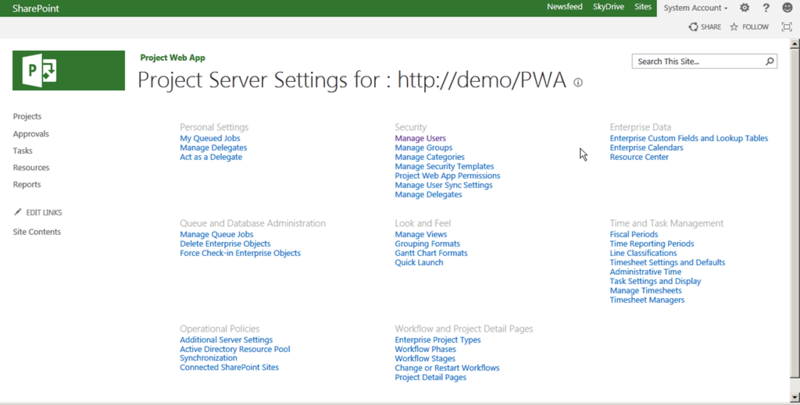 Navigate to the Manage View option within Server Settings. 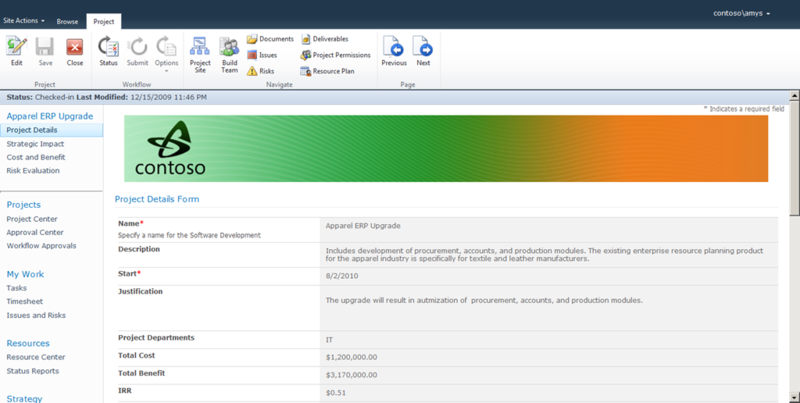 Make a copy of the Project Center Summary View. Note that I like to prefix any custom view with a “*” and the company name. This allows me to easily identify the more commonly used views. Take the view out of every category but the My Projects category. 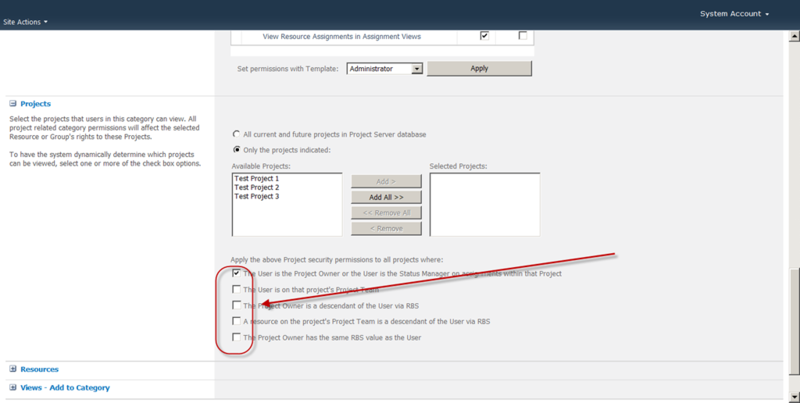 For the next step, we’re going to review the My Projects security settings as applied to the Project Manager group. 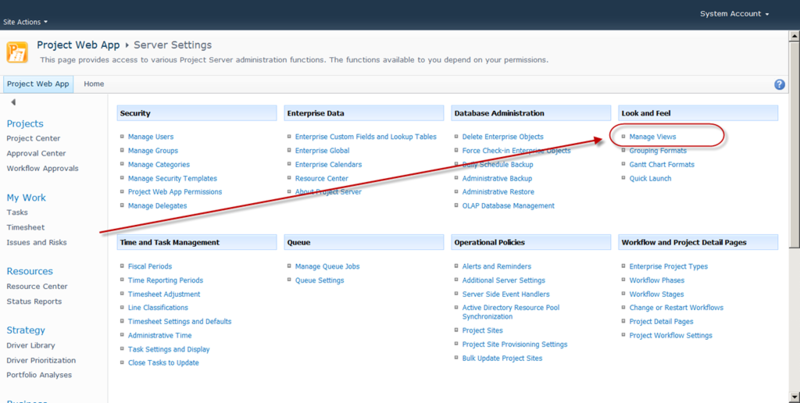 Within Server Settings, navigate to the option to Manage Categories. Click on the My Projects category. Note the default settings for the category. Uncheck two of the boxes so the settings look like this. Note that this may have some unintended consequences as the Team Members may be using that category to view projects to which they have been assigned. If you believe that changing this security model may have a significant impact on your organization, simply copy the My Projects category in the beginning and then follow the same instructions. 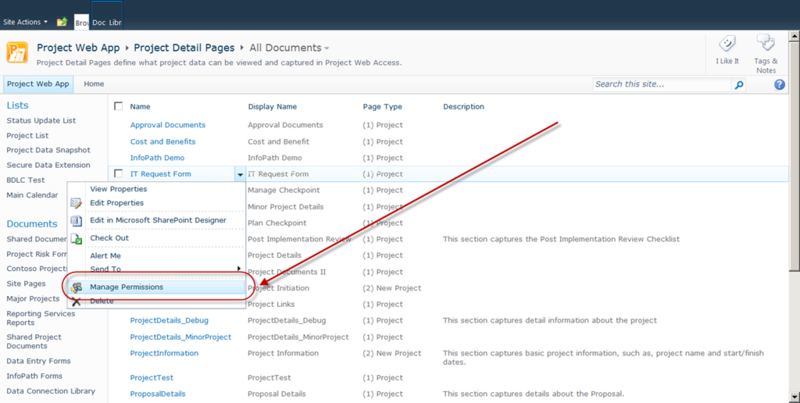 The end result should be a filtered list of personal projects within the Project Center view.